﻿ Q264: How can I accept Bitcoin payments (BTC)? FAQ Q264: How can I accept Bitcoin payments (BTC)? You can accept Bitcoin with Planyo's Coinbase.com integration. Coinbase is a leading BTC payment gateway and the first million in accepted payments is completely commission-free. It will also immediately convert the BTC payments to your currency so you don't have to worry at all about the highly variable exchange rates. In your Coinbase account settings, go to "API". 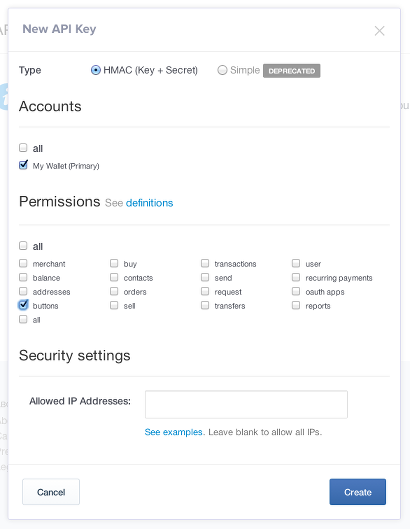 Then generate a new API key of type: HMAC (Secret+KEY) -- this is the default. In PERMISSIONS make sure you ONLY select BUTTONS. We do NOT want to give more permissions to this api key. 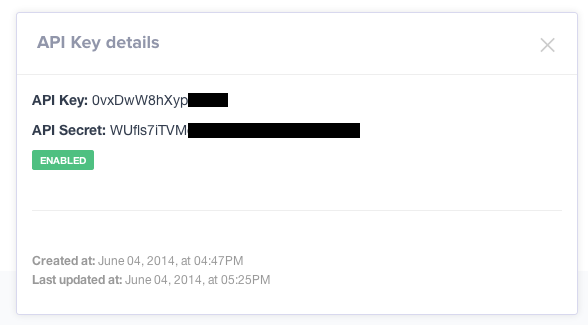 After you create the key, you must still enable it (requires verification by email). Then click on the key and you'll see both the API key and API secret. Now that you have your API keys, you'll need to go to planyo, choose Coinbase in Site settings / Online payments and enter both the API key and the API secret separated by slash. Of course you can use two payment gateways, such as Paypal and Coinbase to offer to your customers a possibility of paying either with a credit card or with Bitcoins.